The recent U.S. oil and gas boom has transformed hundreds of communities across the country—from rural areas and small towns to suburbs and cities—into industrial production zones. Oil and gas companies are using unconventional techniques such as hydraulic fracturing—known known as “fracking”—to extract deposits wherever they can be reached, even if those places are in the backyards of homes, near schools or places of worship, or on farmland. Oil and gas production uses hundreds of toxic chemicals that are emitted directly or escape into the air, exposing residents, workers and animals. In 2012, twelve community groups in 6 states (Arkansas, Colorado, New York, Ohio, Pennsylvania and Wyoming), with support from a team of national organizations and experts, decided to test the air near oil and gas development sites located in their communities. 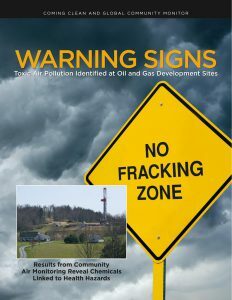 The new report from Coming Clean and Global Community Monitor, titled Warning Signs: Toxic Air Pollution Identified at Oil and Gas Sites, provides results from community air monitoring in those states near oil and gas development sites, including where hydraulic fracturing, or “fracking,” activities or waste disposal are taking place. Results show a wide range of hazardous chemicals are present in the air at levels above federal health and safety standards. In some cases, monitors revealed concentrations of hazardous chemicals high enough to pose an immediate health threat to people. • Eight chemicals classified as volatile compounds, were found in concentrations in excess of either the U.S. Environmental Protection Agency’s most hazardous cancer risk level or the minimal exposure levels for non-cancer risks (minimal risk level or MRL), set by the Agency for Toxic Substances and Disease Registry (ATSDR) About 38 percent of the samples (29 of 76) contained concentrations of volatile compounds exceeding these federal standards. • The chemicals that most often exceeded health and safety standards were formaldehyde, which is a known human carcinogen, and hydrogen sulfide, nerve and organ toxin known by its rotten egg odor. • Seven samples, all from Wyoming, contained hydrogen sulfide in concentrations ranging from more than twice to 660 times the level classified by the EPA as immediately dangerous to human life. • Fourteen samples — seven from Arkansas, six from Pennsylvania and one from Wyoming — contained concentrations of formaldehyde exceeding the EPA’s most hazardous cancer risk level. 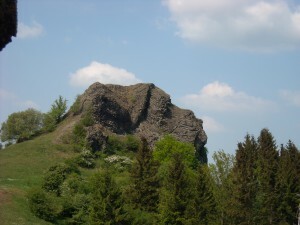 • Several other chemicals were detected at concentrations above health and safety standards. Four samples from Wyoming contained benzene, a known carcinogen, in concentrations above EPA’s most hazardous cancer risk level. Seven samples from Wyoming and one from Pennsylvania contained hexane, a nerve toxin, at levels above either ATSDR minimal risk levels or the workplace safety standards for long-term exposure set by the Occupational Health and Safety Administration (OSHA). One Wyoming sample contained hexane at 7,000 times OSHA’s minimal risk level. Five Wyoming samples contained levels of the nerve toxins toluene and xylene at levels exceeding either the short-term or long-term minimal risk levels.